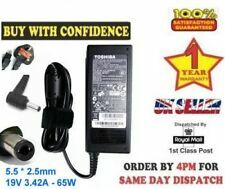 Compatible with Laptop Model Such as battery, ac adapter etc. AcerNote / AcerNote Light Series. 1x AC adapter. Cable is included. Currently, our after-sale workmate good at English. (Apply for Battery Only). Compatible ModelC660 L300 L450. C660-1LM, C660-173, C660-155, C660-1K9, C660-11K, C660-1E2, C660-115, C660-16T, C660-1LP, C660-174, C660-172, C660, C660, C660-1KT, C660-120, C660-1F1, C660-116, C660-16V, C660-1LR, C660-17J, C660-17E, C660-106, C660-111, C660-125, C660-1G3, C660-117, C660-16W, C660-1LT, C660-17W, C660-184, C660-108, C660-12F, C660-102, C660-14X, C660-1J6. Output: 19V - 3.42A. Overload Protection. Power Saving. low energy consumption. Short-circuit protection. Special Features Plug Tip Size: 5.5mm 2.5mm. Input: 100-240V /50-60Hz. Output:DC19V 4.74A 90W. 1 x AC Adapter 1 x Power Cord. "CTRL" "F" to find your laptop model/part number printed on your laptop bottom or original adapter. Toshiba Dynabook AX2 Series. Toshiba Dynabook AW2 Series. Compatible ModelC660 L300 L450. 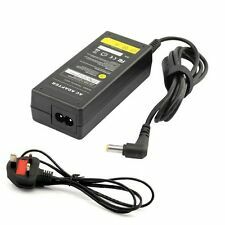 Compatible with Laptop Model 1x AC adapter. Cable is included. AcerNote / AcerNote Light Series. Country/Region of ManufactureChina. 102918, 103310,103739/ 103905,103907,105926,105927,105928,ACE83-110087-3100. 1 x pc of Power Adapter. Such as battery, ac adapter etc. (Apply for Battery Only). We will very appreciated for your doing. You may also like. Output Power75W. Our 99% item locate UK Local warehouse. 1 x pc of Power Cord. 1 x pc of Power Adapter. GATEWAY Solo. L450-13P, L450-181, L450-16K, L450-17K, L450-13L, L450-188, L450-17L, L450-13M, L450-18D, L450-16Q, L450-17P, L450, L450-179, L450-17K, L450-17R, L450-17Q, L450-13Q, L450-17L, L450-188, L450-13R, L450-17P, L450-18D. Compatible with: GATEWAY GATEWAY Solo Solo1100 / Solo1150 / Solo1200 / Solo1400 / Solo1450 / Solo2100 / Solo2150 / Solo2200 / Solo2300 / Solo2350 / Solo2500 / Solo2550 / Solo3100 / Solo3150 / Solo400S / Solo450 / Solo5100 / Solo5150 / Solo5300 / Solo5350 / Solo600 / Solo9100 / Solo9150 / Solo9300 / Solo9500 / Solo9550 GATEWAY E Series E-100M / E-100M-G / E-100M-SB / E-155C / E-155C-G / E-265M / E-265M-G / E-475M / E-475M-G GATEWAY 3000 Series 3000 / 3018 / 3040 / 3500 / 3520 / 3522 / 3525 / 3545 / 3550 / 3610 / 3018GZ / 3040GZ / 3100-Fireant / 3100SE-Fireant / 3100SL-Fireant / 3100XL-Fireant / 3150 / 3150S / 3520GZ / 3522GZ / 3525GB / 3545GZ / 3550GH / 3550GZ / 3610GZ / 3610GZ GATEWAY 4000 series 4000 / 4010 / 4012 / 4014 / 4016 / 4024 / 4025 / 4026 / 4028 / 4030 / 4520 / 4525 / 4528. POWER CORD is included where applicable. Warranty: 1 Year. Connector Size: 5.5 x 2.5mm. DC Output: 19V 3.42A. AC Input: 100~240V / 50-60HZ. Output: 19V - 3.42A. We do our be st to provide products that satisfy you. hope you could understand. Note: Applicable US plug. Over Temperature Protection. Overload Protection. Power Saving. low energy consumption. Output : 19V - 3.42A. Compatible with Laptop Model 1x AC adapter. AcerNote / AcerNote Light Series. Gateway Solo,M,4000 Series. Acer TravelMate 800 Series. Acer TravelMate 720 to 740 Seriesc. Acer TravelMate 600 to 663 Series. Outputs: DC 19V 3.42A 65W. Tested for safety in the UK at an approved CE testing facility. Toshiba Equium. Toshiba Dynabook. We have been in the industry since 2006. At Adil-Skee we take your security very seriously. Compatible Part Numbers. (Compatible with Laptop Model Such as battery, ac adapter etc. AcerNote / AcerNote Light Series. 1x AC adapter. (Apply for Battery Only). We will very appreciated for your doing. excluded.). Acer Extensa 2000,2300,2350, 2500, 2600, 2900,3000,3100,4100 Series. (Such as battery, ac adapter etc. (Apply for Battery Only). We will very appreciated for your doing. Our 100% item locate UK Local warehouse. excluded.). M65 Series. M60 Series. M40X Series. Such as battery, ac adapter etc. All item passed FCC / CE / ROHS certificates. Fit Models We work with a good quality supplier and factory. Help you and us save money greatly. We will very appreciated for your doing. Full 1 year warranty. Plug Tip Size : 5.5X2.5MM. TOSHIBA EQUIUM L10. TOSHIBA EQUIUM L15. TOSHIBA EQUIUM L20. TOSHIBA EQUIUM L20-198. TOSHIBA EQUIUM L20-264. TOSHIBA EQUIUM L25. TOSHIBA EQUIUM M40X. Compatible ModelC660 L300 L450, X555L. 1x AC adapter. DC connector size:5.5 2.5mm. Such as battery, ac adapter etc. All item passed FCC / CE / ROHS certificates. 1 x Power Cord. We work with a good quality supplier and factory. Help you and us save money greatly. Condition: New. Laptop Parts. Condition New. Technical Information. United Kingdom. Power: 65W. Why Buy From Us?.